I am a French Computer Science student at Polytech Nantes, the graduate school of engineering of the University of Nantes, in France. Friends and students often ask me to explain how I manage my time and what I do — because, yes, it looks a bit unusual for a 21-year-old man. Here is the post I should have written some time ago. I want to introduce you to my brain extension: Trello. In my opinion the service is a very efficient tool an this is why I use it daily (beside Vim, Tmux, Google Calendar, Messenger and Slack). My To Do board — slightly edited for this post and translated from French into English. The only board I use is the “To Do” board. It is the core. Like a second memory I can access whenever and wherever I want. I often say that all my life is on Trello. It’s here, in the “To Do” board. Lists 1 to 4 are for planned tasks and work. Dealing with school-related task or not. List Other stores cards like a note app would. It only contains two items at the moment but it could hold many more. Like Gift ideas, random thoughts, texts I’ve written in a hurry. As you can see, some cards also have labels. Dev is for tasks dealing with code. Waiting is for cards that are waiting for an external event (phone call, email, etc.). Urgent and Important are labels I use to prioritize cards with the Eisenhower matrix. School is for cards dealing with school subjects. Decision needed is for cards which have been on the board for too long and for which I struggle to action. Let’s take a look at some cards. There are small cards like “🏃Run”, “Create party Facebook event 🎉” and more complete ones. Small cards are for things we would usually write down on paper, or on a smartphone note-taking app, or on the fridge. There are also for those things that we don’t even write down at all and that we try to remember. Bigger cards like “Summer Internship 2017” carry more substance. They are little projects of their own (but don’t need their board as yet). As you can imagine, the Today list contains tasks I want to complete on the day and projects I want to work on. The first thing I do in the morning, before starting anything, is checking my Trello board. The night before, I have taken some time to plan the next day according to what I’ve done and what cards are in the This week list. Cards are ordered by priority. This way, no decision-making is required. I already know what to do. Big cards are not for one-off tasks but represent whole projects — like courses — that could stay on the board for 3 months or so. When I work on them it is usually because there is a ToDo checklist item to do. When I work on a card I assign myself to it. This way, if I’m distracted by something I can always look back at Trello to know what I was working on. It is also a psychological trick: each time I assign/unassign myself to a card it feels more realistic. “OK, I’ve really started working on this”. “OK, I switch to this”. The purpose of this board is beyond planning. It also enables me to jot down anything that might unexpectedly go through my mind. When I suddenly think of something interesting, I put it in the Today list. When I find a great quote, I put it in the Today list. When someone asks me something but I can’t help immediately, I put it in the Today list. When I have a new match on Tinder but I can’t send a message straight away, I put it in the Today list. You get the idea, the Today list becomes my working memory. The idea is to free my brain for all these things. Once I am done with what I was doing or at the end of the day, I clean the list, rewrite those temporary cards, move them in the right list and save things where they belong. Once something is done, I archive the card. I can always look back for something I’ve done in the past with the Trello search. Sometimes there is a card concerning a project that has its own Trello board. It makes sense. This card is here for me to plan when I work. Cards on the other board concern the project itself. In that case, I add the link to the other board in the card as an attachment. No need to search. I also use Repeating cards. These are cards that copy themselves where and when they are asked to. Here is the “Morning pages” card repeat configuration. Every day at 2:00 AM a new card “Morning pages” appears at the top of the Today list. 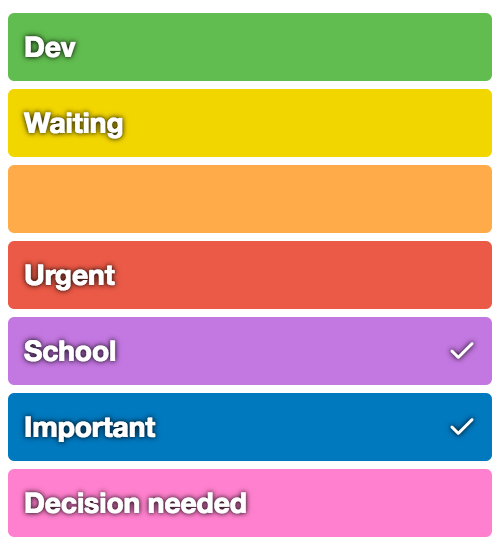 I have also made a custom script using the Trello API that moves the cards according to their due dates. 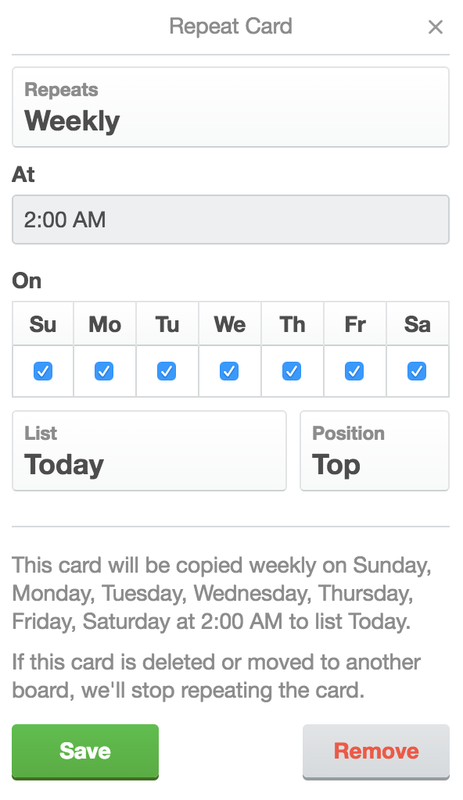 For example, if a card in the This week list is due the day after, it’s automatically moved into the Tomorrow list. There is no exception to this workflow. Following this strictly is the key to not forgetting anything and to save a lot of time. It’s not that hard. Frankly, in time I have come to realize that the key is to keep the moment you decide to do something separate from the time you actually action it. It is really a powerful tool. Sometimes, we simply can’t take the right decision — it’s called Decision fatigue — but we can work on something we have planned before. I use emojis in card names to differentiate cards visually. 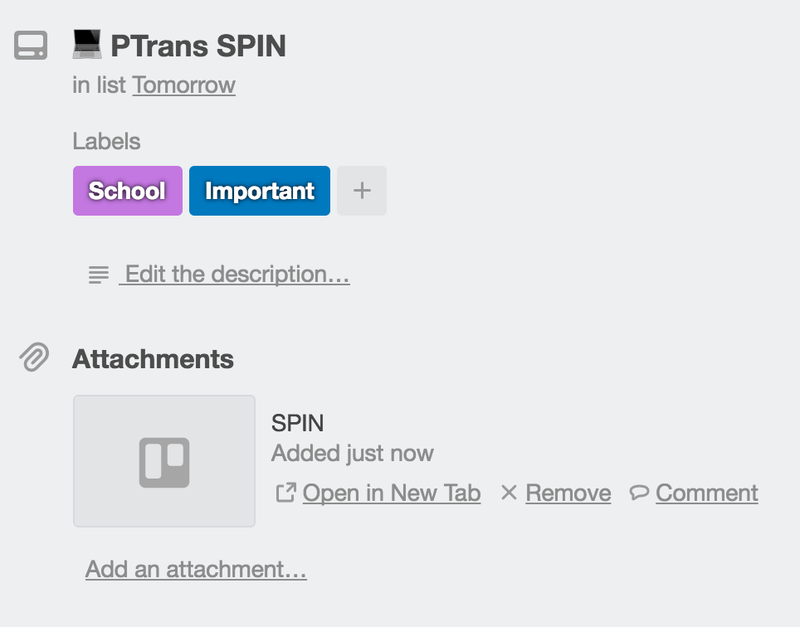 I add attachments to card like Google Docs, useful links, etc. so as not to waste time looking for the resource somewhere else. I keep Trello open on my desktop as a pinned tab. I also put the Trello app on my first smartphone screen and use Android/iOS widgets. The idea is to be able to save quickly something that comes to mind. Once a week, Sunday evening, I have a card “Planning future” that shows up in my Today List for me to plan my Tomorrow and This week list. 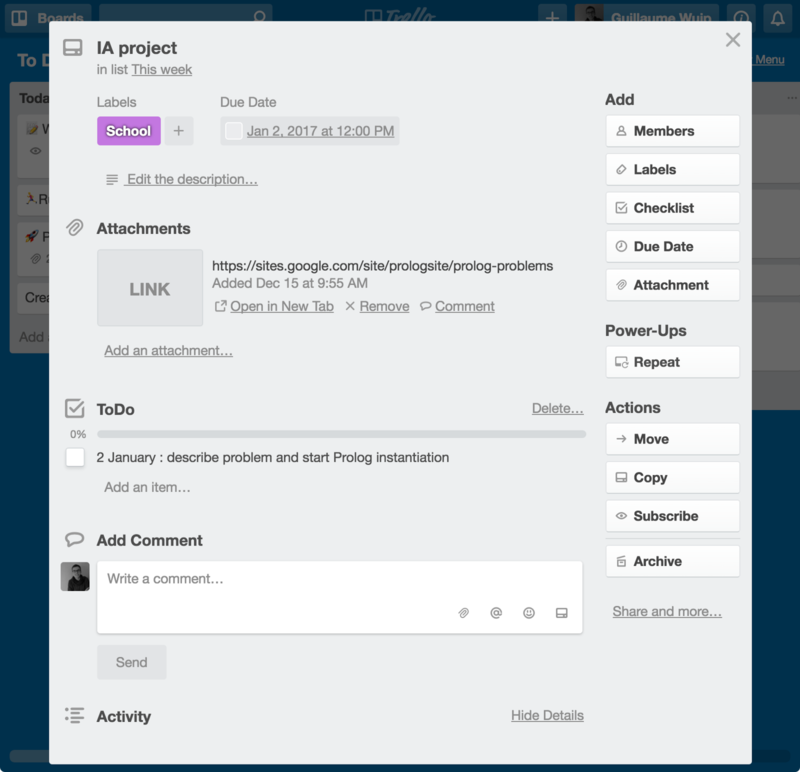 I have added Trello to Google Calendar. I like to see cards with due dates in my agenda. Sometimes I hesitate to add a card about something too touchy even if the board is private. So I just call the card “AAAA”, “1234” or a random emoji. This way the subject is not consuming my brain memory anymore, and someone looking over my shoulder when I’m on Trello can’t guess anything. I am also a heavy user of the Trello keyboard shortcuts. This Trello routine I have built over the past 2 or 3 years is what allows me to be extremely efficient and achieve more. It helps me switch tasks during the day as well as move a project forward quicker. It’s not about multitasking. It’s about following a strict routine to work on things one after the other and delegating part of this routine to a service. I am a French Computer Science student at Polytech Nantes, the graduate school of engineering of the University of Nantes, in France. Currently in my 4th year of studies, I have a strong passion for web development, data and more recently AI. This summer I have the opportunity to do a 3-month internship abroad, so if you are looking for a creative and forward-thinking developer intern, do contact me. ✉️ Want to get in touch? Fell free to reach me on Twitter@guillaumewuip or by email at clochard.guillaume@gmail.com. 🔗 Here’s my website : guillaume.wuips.com.